having traveled all the way from Al Ain UAE converge in Philadelphia to trot out their internationally acclaimed dog and pony show on iPadagogy: A Bloomin’ Better Way to Teach. 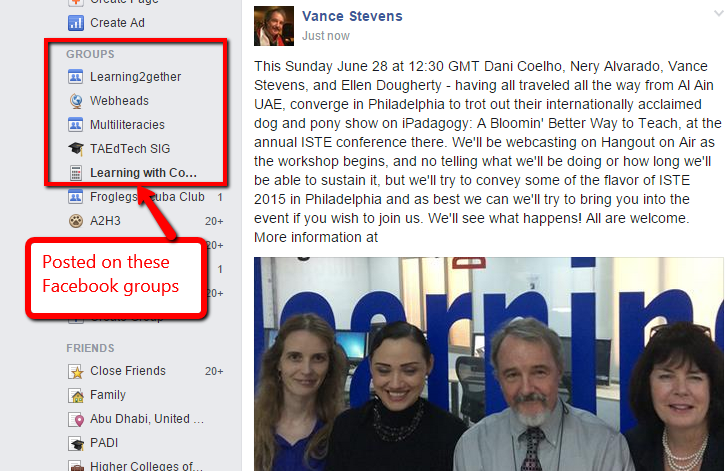 The hangout starts as the workshop begins (see ‘handout’ links below), and no telling what we’ll be doing or how long we’ll be able to sustain it, but we’ll try to convey some of the flavor of ISTE 2015 in Philadelphia and as best we can we’ll try to bring you into the event if you wish to join us. We’ll see what happens! All are welcome. The first part of this event was recorded as a Hangout on Air (HoA). Vance had set up a laptop PC to manage the stream and was walking around the room with an iPad that was participating in the event and recording video and audio. The hub PC was muted and Vance was using earbuds on the iPad to prevent remote participants in the HoA from intruding on the live session (but they could interact with Vance and Vance could interact with them sotto voce but that interaction appears in the recording). Surprisingly the bandwidth held out and the experiment worked in concept, though the next stage will clearly need to address managing the handheld iPad camera movement. If you get dizzy the recording is worth listening to.